Diego Matamoros in Cage. Photo by Cylla von Tiedemann. 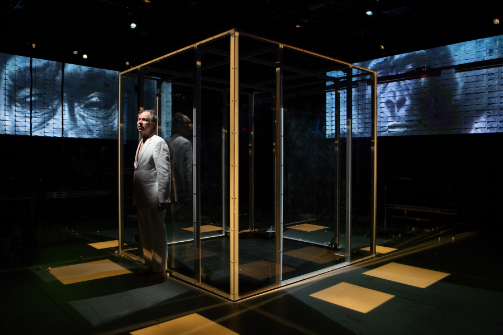 BOTTOM LINE: This "meditation" is a part of the Canadian Soulpepper Theatre Company's month-long NYC residency, and incorporates sound, video, and ping pong balls to present a thought-provoking experience. Diego Matamoros, Lorenzo Savoini, and Richard Feren created Cage as a unique experience. I find it difficult to call it a play, but think of it as an exploration, experimental theatre, or as Savoini refers to it in the Playbill's Artist Note, "We welcome you to our meditation." The production reflects their stated influences: "apes, Zen Buddhism, and the ideas of avant-garde composer John Cage." Cage is both fun and out of the ordinary. There is a playful element that is integrated throughout the seriousness of the production. Diego Matamoros, Lorenzo Savoini, and Richard Feren have created a true ensemble piece. It demonstrates one of the guiding principles of Zen Buddhism: "Do one thing at a time. Do it slowly and deliberately. Do it completely. Do less." They spend most of the show doing one thing at a time—one simple thing at a time, to be specific. We start out observing and listening to the sounds of various items under a microphone: the shaking of wooden beads, dice, a horn, ping pong balls, etc. It is simple, yet holds our attention. With few words throughout, the piece shows a variety of interactions: acting as a gorilla in a zoo, drinking cups of tea on the floor, walking in and out of ping pong balls strewn across the stage. We hear music, yelling and loud noises (so remember to turn your hearing aids down about 40 minutes in) and we observe Feren, Matamoros, and Savoini interacting in complete silence. Videos are projected on the walls. The performers write scientific equations and paint and move within the space in unique ways. I thoroughly enjoyed my hour in their scientific, artistic, thought-provoking space, but it is strange. My fellow-theatergoer did not feel the same way. He felt as if he needed more explanation. That is where I see the beauty of the piece. What is observed can be interpreted a myriad of ways. For instance, when Matamoros is put into the "cage" in the center of the room, I find the way he gets there interesting. Initially the door is closed, barely visible on the side of the clear, windowless cube. Another performer opens the door and suggests that Matamoros enter, but ultimately, Matamoros is the one who walks in on his own. The door is shut, but there is no lock and key. We all know where the entrance is, yet he is in there trapped. Just because the door is open and it is assumed he would go inside does not mean that he must. Many of us are often swayed by others, but ultimately we choose whether or not to follow their pushing and prodding. Our "cages" are not locked, and in fact, Matamoros is the one who lets himself out later in the performance. In the square room where Cage is performed, there is one row of seats lining each wall, hence, everyone is in the front row. On top of that, know that one member of the audience is chosen for brief participation during the show. This type of production is not for everyone. It is experimental, out of the ordinary, and weird. If you want a standard play or musical, this is not the show for you. Those who want a thought-provoking experience would get more out of this production. I look forward to seeing what else Soulpepper Theatre Company does during their residency at the Pershing Square Signature Center this month. Cage was created by Diego Matamoros, Lorenzo Savoini, and Richard Feren. Production Design was by Lorenzo Savoini. Sound Design was by Richard Feren. Choreography was by Shannon Litzenberger. Production Stage Manager was Robert Harding. Stage Manager was Arwen MacDonell. The cast was Richard Feren, Diego Matamoros, and Lorenzo Savoini.